God is our healer. He restores, renews and removes those things that should not be there. He reverses the curse and makes crooked places straight. God desires that you remain healed. Now obey what He tells you in order to keep your healing. We have a church here, but also church is where we are. Walk with the power of God on you. Be activated always. Keep the Spirit turned on. Remember the Gifts of the Holy Spirit operate as our relationship with God is activated and we seek and desire Spiritual Gifts. We receive by asking and then by obeying. Prepare yourself with the truth of the Word. God speaks to each of us differently. Some see visions, hear voices, but usually it is through God’s Word and the Holy Spirit’s inner witness inside us. God’s Word activated in us will revolutionize our city, our families and ourselves. 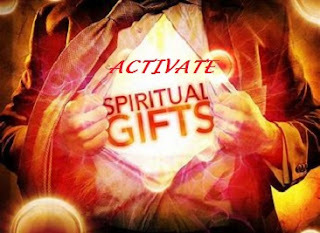 God desires to activate Spiritual gifts in us as we draw near. I Corinthians 12:1-7 Paul reminds us not to be ignorant, but to earnestly desire Spiritual Gifts. 8. Realize there are differences of administration, operations and manifestations, as well as diversities and differences of the gifts. The Gifts of the Holy Spirit are to profit you and others. To one is given by the Spirit the Word of Wisdom, the Word of Knowledge, Special Faith, Gifts of Healing, Working of Miracles, Prophesy, Discerning of spirits, Divers kinds of Tongues, and Interpretation of tongues. All these gifts work by the Holy Spirit dividing to each person as He wills. The gifts do not make us better than others, but are to equip and benefit for the profit of all. All the Gifts are given by ONE the self same Spirit the same God. I Corinthians 12: 28 And God hath set some in the church, first apostles, secondarily prophets, thirdly teachers, after that miracles, then gifts of healings, helps, governments, diversities of tongues. Paul asks, Are all prophets, or are all teachers, or workers of miracles? Do all speak with tongues, do all interpret? The caution is that all the gifts operate by love. Follow Love, but earnestly desire Spiritual Gifts, especially to prophesy. Are you ready for this? It may be too deep for some of you who are still rejoicing in Salvation, and are at the basic level. We need to consider that there is MORE and we are to seek and activate what is available. Jesus encourages us to step up and step out to exercise what is in us. The Holy Spirit in us holds all the Gifts, We must activate what is needed at the time. Be willing to move into God’s plan for you. God works usually through individuals, so we must be willing to be used of God. Call on Him to activate in you, His Gifts. He will reveal to you, Step one, two and three. Pastor called all those who desired prayer for healing to come forward and many came and were prayed for.